Couldn’t make it to a concert you were dying to see? Check us out. You’ll feel like you were there. Do you sometimes find out after the fact that one of your favorite bands or artists has a new album? Consider us your music resource. Enjoy discovering new music with talented musicians? Join us for the party. 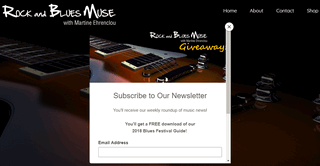 Rock and Blues Muse will keep you up-to-date on new releases, undiscovered artists, and music gems you might have missed or want to revisit.